Military veterans from Fulton County were among about two dozen to participate Nov. 11 in the 2nd Annual Veteran’s Day Pheasant Hunt, sponsored by the Fulton County Sportsmen Club and the Fulton County chapter of Pheasants Forever to honor their service. Seventy-five male pheasants were funded through a grant from the Ohio Division of Wildlife, and ammunition, guides, and bird dogs were provided. Hats were donated by the Sports Place at Ace Hardware in Wauseon, and landowners Rob Brubaker, Kenny Frey, Chris Grime, and Bill McKinney allowed the pheasants to be placed on their property. https://www.fcnews.org/wp-content/uploads/sites/45/2018/11/web1_FCSC-Veteran-s-Hunt-2018.jpgMilitary veterans from Fulton County were among about two dozen to participate Nov. 11 in the 2nd Annual Veteran’s Day Pheasant Hunt, sponsored by the Fulton County Sportsmen Club and the Fulton County chapter of Pheasants Forever to honor their service. 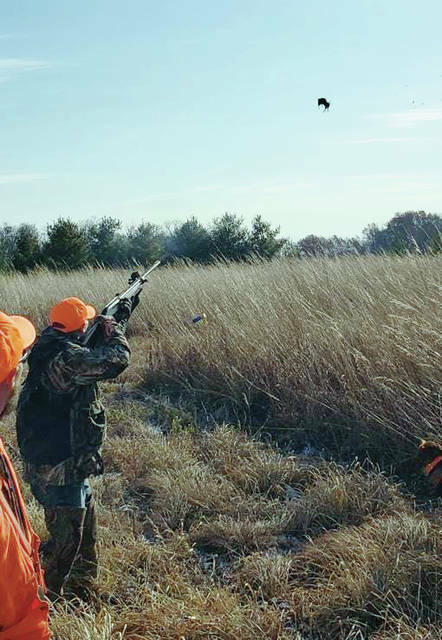 Seventy-five male pheasants were funded through a grant from the Ohio Division of Wildlife, and ammunition, guides, and bird dogs were provided. Hats were donated by the Sports Place at Ace Hardware in Wauseon, and landowners Rob Brubaker, Kenny Frey, Chris Grime, and Bill McKinney allowed the pheasants to be placed on their property.